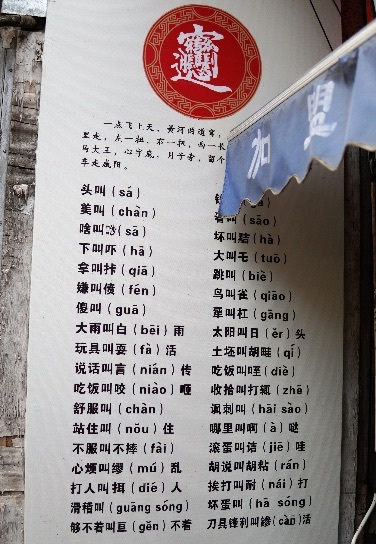 A much longer list of Shaanxi expressions may be found here. Note that many Shaanxi usages go back a thousand or two thousand years ago. The capital of Shaanxi Province, Xi'an, was a historically very important city that lay at the eastern end of the so-called Silk Road (the transcontinental trade routes that already existed long before silk was traded along them) and just south of the Ordos, which was a vital zone of interaction between the steppe and the sown. That's the whimsical, whacky character for "biang", a type of noodles that is popular in Shaanxi province. It was also, of course, the capital of various Chinese dynasties, most notably perhaps the Tang (at which time it was called Chang'an).